Severed limbs and the living dead may be fine for adult Halloween parties but young kids (and their parents) usually prefer age-appropriate fun over a horrifying fright night. 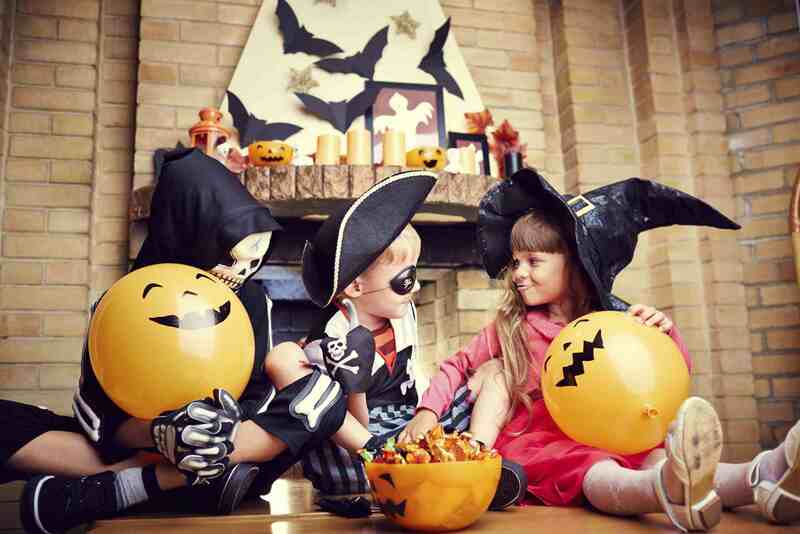 Whether you're planning a Halloween party before children go door-to-door in the neighborhood or as an alternative to trick or treating altogether, host budget-friendly Halloween parties that show guests a howling good time. This ultimate guide to kid-friendly Halloween party ideas that aren't scary gets your guests excited about coming to your house. Show parents you're hosting a fun, family-friendly Halloween party instantly. Great non-scary Halloween parties start with the invitations and make an impression that your party is out the norm in a good way. Choose friendly Halloween images that show your party isn't going to be a night of blood and gore. Your kids can help create beautiful rubber stamped invitations or you can simply hit the print button with ready-to-go theme invitations for your party. Design your own party invitations on computer with Halloween clip art and festive fonts or try one of these free templates for Adobe Illustrator. Decorating for Halloween parties is half the fun of throwing them. Use a jack-o-lantern with dry ice fog as your centerpiece to wow kids of all ages. Instead of ugly plastic spiders, place cute crochet spiders in webs around your house. Bring some of your Halloween yard decorations in to complete your party scene. When planning out your decorations, remember to think about your youngest guests too who may find some seemingly innocent Halloween decor too frightening. Devilish dishes are a must but you don't want to overdo it. Older kids may enjoy the gross-out factor with bloody eyeballs and brains on the half skull. Younger children will need the menu toned down by offering witch hats candy and freaky fudge. Oh, the horror of trying to narrow down your Halloween food choices! Soda from a plastic bottle? Not at your party. Turn orange soda, gelatin and ice cream into Igor-Ade. Brew a batch of Alienade out of lemonade and a couple of drops of food coloring. Offer a slippery sip of slime juice or give kids the chills with a Halloween milkshake to fulfill your evil drink plan. While this Halloween Monster Punch recipe sounds scary, kids will be cackling with delight when they see this guy's friendly face in their cups. What's the fun of a Halloween party without the costumes? Even non-crafty moms can shop around the house to make easy Halloween costumes on a budget. If you're handy with a needle and thread, look through these homemade costume patterns you can sew yourself. Prefer to buy a costume? Hit the stores for the must-have costumes of the year. As a non-scary Halloween party reminder, include a note in your party invitation that requests guests don't show up in scary costumes. You don't want to go to the trouble of planning the perfect kid-friendly Halloween party only to have a dozen kids show up as bloodied zombies with bulging eyeballs. The party atmosphere won't be complete without a touch of spooky music. While older kids may enjoy the spine-tingling screams from scary movie music, lighten up the playlist for everyone with Halloween songs just for children. Even the tiniest ghost or goblin at your party won't be afraid of songs like "Five Little Pumpkins" or "No Costume, No Candy." Many songs and sound effects for your Halloween party can be downloaded for free. After everyone's been fed, your party may turn into a night in Sleepy Hollow. Keep everybody on their feet with Halloween games that get your guests moving. Set up some homemade carnival games. Burn off some energy in a mummy race or play a party-long game of Halloween jinx to earn the most candy. Games for younger children include "Who's the Ghost?" and "Pin the Nose on the Pumpkin." Bring an eerie silence to your party with Halloween crafts kids can keep as mementos. A ghost and pumpkin tree can be scaled down to a tabletop decoration kids can display each year. Tiny scarecrows can be made with popsicle sticks and glue. Try bat crafts, cat crafts or have everyone make mini haunted houses out of recycled materials. Give children a treat bag just for coming to the party. Make a felt treat bag they can use every Halloween, print a party favor bag from a template or decorate a paper bag with stamps, paper and ribbon. Once you've made your treat bags, fill them with Halloween treats for the road. Homemade gummy worms, Halloween rice crispy treats, cobweb cookies and Halloween candy sushi will hold up well when carried to and from the car in the treat bag.